Contains no sucrose – May help reduce dental problems. Contains DentaGuard – May reduce the occurrence of dental calculi. Designed to provide all key nutrients – When used with vegetables, fruits, and browse. 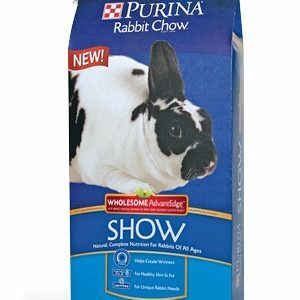 Utilizes a variety of proteins – Ensures adequate supply of nutrients. Formulated to be used as part of any primate program. Product Form: Biscuit size: 1/4″ x 1/4″ x 1″ length. 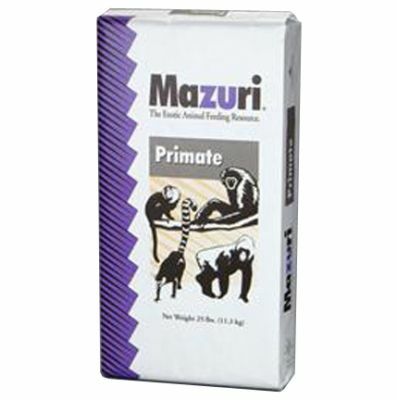 Mazuri® New World Primate Biscuit is designed to be an essential part of a total primate feeding system and may be used in conjunction with all of the Mazuri primate products. 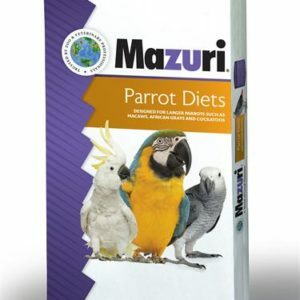 Depending on management needs, Mazuri® New World Primate Biscuit may be used as a base diet for all new world primates. Primates generally consume 2% to 4% of their body weight per day (i.e. a 50 kg animal will eat 1 to 2 kg of food per day) on a dry matter basis. Mazuri® New World Primate Biscuit can be supplemented with fruits, vegetables, and browse or other items as long as the dry matter of these items does not exceed one-third of the dry matter consumed. 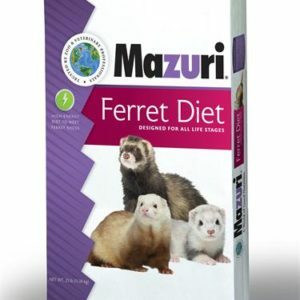 Using typical fruits, vegetables and browse, an as fed basis feeding program would consist of 60% fruit and 40% Mazuri® New World Primate Biscuit (i.e., a diet may be 6 lb. of vegetables plus 4 lb. of Mazuri New World Primate Biscuit). If given too much food, primates are prone to waste it and/or become overweight. 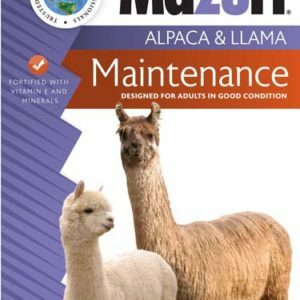 Adjust feed intake to maintain primates in an ideal body condition. Primates require vitamin C. Mazuri® New World Primate Biscuit contains a form of vitamin C that is stable for at least 270 days from the date of manufacture which is printed on the bag. Animals should always be provided a clean source of water. Dehulled Soybean Meal, Ground Corn, Wheat Middlings, Soybean Oil, Fructose, Dried Egg Product, Wheat Germ, Ground Wheat, Dried Whey, Corn Gluten Meal, Dried Beet Pulp, Calcium Carbonate, Brewers Dried Yeast, Acid Casein, Wheat Bran, Dehydrated Alfalfa Meal, Sodium Hexametaphosphate, L-ascorbyl-2-polyphosphate, Folic Acid, Taurine, Pyridoxine Hydrochloride, Salt, Cholecalciferol, DL-Methionine, Choline Chloride, Iron Polysaccharide Complex, D-Alpha-Tocopheryl Acetate, Calcium Pantothenate, Vitamin A Acetate, Menadione Sodium Bisulfite Complex, Biotin, Thiamine Mononitrate, Vitamin B-12 Supplement, Riboflavin, Nicotinic Acid, Zinc Proteinate, Manganese Proteinate, Plant Protein Products, Copper Proteinate, Propylene Glycol, Cobalt Proteinate, Natural Flavors, Ethylenediamine Dihydriodide, Butylated Hydroxyanisole (Preserv), Sodium Selenite.